A visit to Rainham RSPB centre taking the long route from Rainham station to the centre via the Stone Barges returning to Rainham station via the Serin Mound. Joined MM on the way down from the station and first off Rainham 'West' held several Stonechat, and along the path running parallel to the edge of the silts a passerine was flushed by a bird of prey. This was a cracking (silhouetted) Merlin which turned on the after-burners and within seconds belted it's way onto the silts and out of view. Stone Barges was quiet with wintering gull numbers building up and on walking down towards Coldharbour Point small groups of Redshank made their way upriver on the rising tide (50 in total). Stonechat and Reed Buntings were noteworthy in the bushes, if only we had paid more attention to the Stone Barges bushes :) (Nice one SH re the Dusky Warbler). A pair of Common Sandpipers were at the western most end of Aveley Bay and a pair of Avocets flew downriver. On the reserve a male Marsh Harrier tangled with a Buzzard as viewed from the riverwall, and a lone Ring-necked Parakeet flew north over Aveley Pools (5 others earlier south of the river opposite Coldharbour Point). After a rest at the RSPB centre and a brief river watch (nowt moving) decided to head back along the riverwall. A Green Sandpiper called from the reserve and the foreshore held 3 or 4 Rock Pipits. Set up shop at Serin Mound and it was fairly quiet for the first 30 minutes, but things were about to change. About 13:45 a Brambling flew west calling but I could not pick it out against the leaden sky. Shortly afterwards a male Snow Bunting went through, this one I did get onto, more on the sighting later. 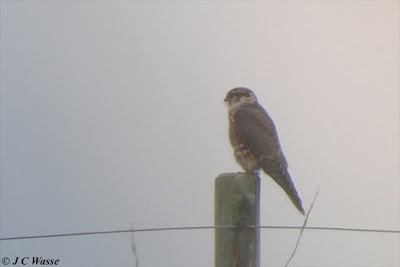 At about 14:20 a small dark Falcon flew low over the old riverwall and landed straight out on Wennington Marsh about 300 yards away, a stunning fem/imm Merlin, fair to say the bird from earlier in the morning. I managed to get the phonescoped record shot of the Merlin below before it took off and was lost to view neat the silts. Sadly it didn't return in the next hour but another birder and myself were treated to nice views of Kestrel, 3 Marsh Harriers (ad male and 2 cream-crown juvs) and distant Common Buzzard and Sparrowhawk. A handful of Chaffinches migrated over as did a lone Redpoll. Then it was time to walk back to Rainham station. A cracking day. A few minutes after a Brambling dweezed somewhere overhead at around 13:45 (interspersed with its supplementary soft 'sup-sup' calls), a piercing 'teu' rung out from over Wennington Marsh. Not a call I was familiar with but quickly tried to remember from the 'Collins Guide' - Snow/Lapland Bunting sprung to mind. The bird repeated the call with same ferocity and I picked it up, a long-winded passerine flying over the marsh which had now started to turn and was making a 'bee-line' for the landfill. I tracked it and as it passed level with me (100 yards away and not very high) I could see extensive white wing flashes of a Snow Bunting and almost simultaneously it gave it's more typical 'trolloping' ripple call, a call I'm familiar with from birding the north Norfolk coast in winter. The bird flew towards the top of the landfill appearing to make heavy weather of it, with slow wing beats revealing the wing flashes in detail confirming it as a male. To be honest the contrast looked like a giant male Banded Demoiselle damselfly (ok the bands do not cloak the end of the wing). The white wing markings were extensive and stretched from leading to trailing edge contrasting with dark wingtips. At one stage the bird was flying with a Skylark in tow, allowing for comparison of the Bunting and Lark shapes. The Snow Bunting being slightly smaller, looked long-winded but they were more slender and the underparts were more streamlined than those features on the Lark. The rest of the body of the Snow Bunting was silhouetted. Light conditions were ok, reasonably neutral with 8/8 cloud cover and hardly a breeze. The bird almost flew back towards the Serin mound but regained it's flight path to the southwest and over the tip. I stayed in the area for a further hour and half, but no further sign. Back again at Rainham RSPB, caught up with SH's excellent find, London's 2nd? Dusky Warbler . It was typically elusive but over a long waiting period managed to have excellent flight views and saw it well in the bushes on 3 or 4 occasions. Calling 'tic' fairly frequently. Walking down to the RSPB centre what must have been yesterday's fem/imm Merlin took off from the slope up to Rainham 'Ridge' west of Aveley Bay car park. It perched on a hillside post and launched itself in pursuit a couple of times, ending up back on a post. After a few minutes it flew off with purpose towards the landfill. I managed to get a few photos (mainly phonescoped). One shown below, much better than yesterday's effort!!! More at 'Latest UK Bird Photos'. 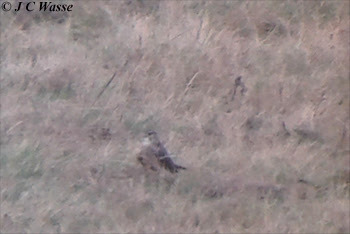 A short video of the Merlin uploaded to my You Tube channel, enjoy.